I recently talked with a man whose cancer has reappeared after enjoying several years of remission. He says that things are going pretty well and that he considers himself to be blessed. My friend pointed out that when he was going through treatments a few years ago, he had a two-year-old granddaughter who loved being by his side. He would often wake up from a nap to find her snuggled up against him. Now, as he is going through treatments once again, guess what? He has another little granddaughter who adores being around her Papaw! 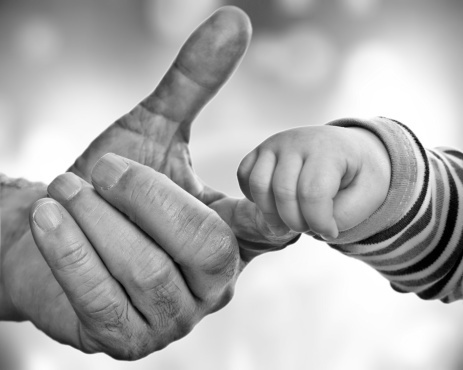 This entry was posted in Christian Living and tagged blessings from God, children are a blessing, comfort, God's goodness, God's presence, grandfather and grandchild, holding hands, illustration, strength from God. Bookmark the permalink.